One question that comes up a lot around here is where to get an Onyx Boox M96, which version is best and what seller to buy it from. So I wanted to put together this article explaining the different places that sell the M96 and what the differences are between brandings. Not all M96’s are the same; it depends on where you get them from what software features it offers, and there are a couple hardware differences as well. For those unfamiliar with the M96, it’s a 9.7-inch ereader with an E Ink Pearl display that runs open Android 4.0 and can install apps. It doesn’t have a frontlight like most of the smaller models, but it does have WiFi and Bluetooth, a memory card slot, it supports audio, and a battery charge lasts about 2-4 weeks. The M96’s specialty is PDFs, and it supports writing onscreen handwritten notes with a stylus (there’s also a version with a capacitive touchscreen). It comes with a bunch of reading apps pre-installed for ePub and other formats as well, plus it can install popular reading apps like Kindle and Google Play Books. The M96 is more of a specialty device than typical ebook readers, and it’s one of the only options for a large-screen E Ink device. See my Onyx Boox M96 review for more details. The “Universe” branded model is sold by Arta-Tech, an authorized Onyx reseller based in Poland. They sell the M96 Universe from Amazon websites and Onyx-boox.com. It comes with Google Play onboard, unlike the imported Chinese model some sellers offer, and it comes with IVONA text-to-speech voices pre-installed and provides access to Arta Tech’s Polish ebook store, BookSource.com. It’s generally one of the least expensive ways to get the M96 when purchased through Amazon because there’s free shipping, but a couple negatives are it doesn’t come with a case and Arta Tech rarely offers software updates, so the eReader-Store version mentioned below has more software features and support, including PDF annotation export. However, the Universe model can be converted to the eReader-Store version with these directions if those software features are important. Note that some websites advertise the M96 with the Universe branding, like Banggood and some sellers on eBay, but these appear to be regular M96’s imported from China that have to be rooted to install Google Play. The best version of the M96 is sold from eReader-Store.de, an ebook reader retailer based in Germany that sells worldwide. The only downside is shipping can be rather expensive. This model is also known as the Booxtor version. This model has a slight edge over the Universe version because the folks at eReader-Store release regular software updates that improve performance and add new features, including PDF annotation export. This version also comes with an upgraded bigger stylus and it has an 85HZ screen instead of 50HZ that the other models use (no idea what the actual usage difference is, as eReader-Store is the only place that mentions this in regards to E Ink screens). There’s been a rumor that this model is going to get updated to Android 4.4 soon. As far as I know, this specific model is only sold from eReader-Store.de. They sell a black model and a white model. The folks at eReader-Store.de also offer a version of the M96 with a capacitive touchscreen instead of having to use a specialized stylus that the regular model requires. This model is called the Boox M96C and is currently exclusive to eReader-Store.de. Aside from the different touchscreen technology, all the other features are the same as the model mentioned above. There’s yet another version of the M96 out there that sells from Chinese wholesale websites like Banggood and from different sellers on eBay. These appear to be the regular Chinese version of the M96, even though sometimes they say Universe. Generally speaking with regards to Onyx’s other models, the only main difference with this version is it doesn’t come with Google Play pre-installed, so you have to root the device and add it yourself, which takes some technical know-how. I’m not sure about the exact process but different sets of directions can be found at MobileRead. Getting the M96 from Banggood is the cheapest option currently. It sells for $336 and that includes a case and headphones, which have to be purchased separately with the other versions. Both black and white models are available. There’s also a rebranded version of the Boox M96 that’s sold under the Icarus brand name. It’s called the Icarus Excel, which is kind of confusing because they also sold the early M92 model under the same name, and still use the pictures from it to advertise the M96 version. The newer version is identifiable by Android being mentioned in the description. I don’t know how this version differs from the other models, as there’s virtually no information or reviews available for it. Since it’s not any cheaper than the regular model, I don’t see any reason to get it instead of a regular M96. That was quite useful.Thank you! We have the M96 Universe (from Arta-tech) version and the Icarus eXceL (with Android) version. And yes, their link doesn’t work anymore, because I have changed my website name… I’ll contact them, thanks! Sorry, we are not aware of that. Our customers are usually happy with us, with their order, and their ereaders. And if there is a problem, we are very keen to find a solution. So, can you be more precise? Nope, wasn’t me. I was unaware of that site until it was mentioned here. There is another site, that has a US street address, that sells the M96, and refurbished models. It also has a link to the “manufacturer website” that lists additional Onyx eink devices, including the Boox i86. It is confusing to figure out why there are so many and which one(s) are legit. Thanks for your effort. Forgot to include that link! That site is confusing. I’ve come across it before. I think it used to be different. I don’t know. Onyx doesn’t help matters by letting resellers use domain names that look just like the official company domain. That website links to the same listing on eBay as the imported model listed above, and they have a high feedback rating so that’s a pretty good indication that it’s legit. Thanks a lot for this! I have the Universe and while I am very happy with the ereader, I would be happier with PDF annotation axport. I’ll try and convert it next time I have a bit of time in my hands. The support guys at Universe are very helpful tho and they did improve the software recently, but totally removed the export function, which was a bit of a disappointment for me. Very usefull review…anyway,something still unclear to me(I live in a “tablet”world,never touch an e-reader):are you able to read at night using this reader? (I mean no light at all);and,generally speaking,is “the front light” the feature required to use an e-reader at dark?Or does it have some kind of “night mode”? I consider to order one,but it is important to know about this feature before. 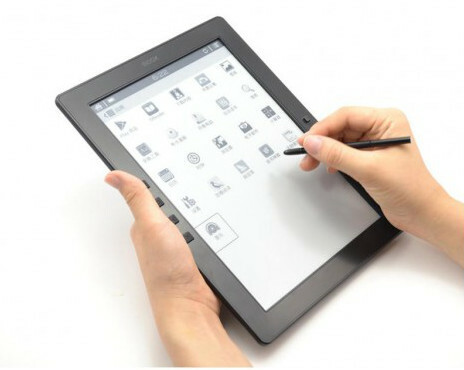 E Ink is like electronic paper. There is no light source without a frontlight, and the M96 doesn’t have one. The Plus version is the updated model with double the storage space and RAM (8GB and 1GB). Hi Nathan, I meant that would the updated model be the Ereader/Booxter version? The Ebay ad said it had Google Play already in there. I want to be able to update my device. I have no idea. A few different places sold the Plus model, including Booxtor.